Below you will find detailed information about the work between Total Foundation and its stakeholders in the educational community, particularly its support for the development of pre- and post-high school training in France and abroad and the educational initiatives undertaken by Total Foundation and other Group entities. 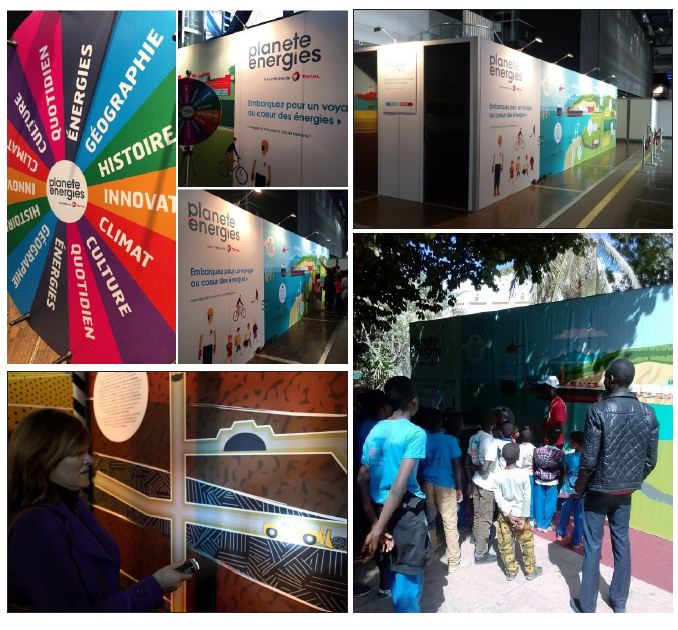 On its educational platform, Planète Énergies has a created a dedicated area for elementary and high school teachers, with the aim of fostering interactive discussion of energy issues. Teaching professionals can also find learning materials (kits, games, presentations, etc. ), open day events and contests. Ongoing reviews and a large number of teacher members are the best means of guaranteeing the effectiveness of Planète Énergies’ actions. The home page is updated every week, thereby constantly providing users with new content. The teachers’ corner offers educational tools and activities, learning materials and classroom presentations. Teachers can access a range of videos, educational kits and learning materials developed in tandem with our partners La Recherche, Nathan and PlayBac. Our experts create free classroom presentations for students aged 9 to 18, answering all their energy questions . Teachers and students can follow and share all the latest energy and environmental news thanks to the calendar, educational activities and directory. 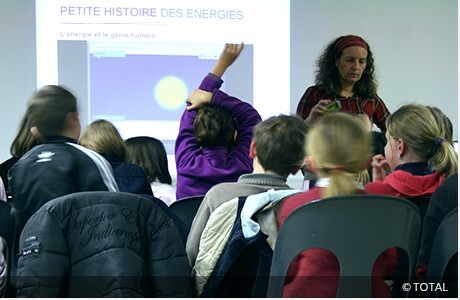 Planète Énergies organizes educational energy presentations for French schools. Available in three formats (elementary, middle school and high school), they provide students aged 9 to 18 with the keys to understanding the full spectrum of energy-related topics. The free presentations are delivered either by our specialist partner or voluntarily by active or retired Group employees. In the 2017-2018 academic year, 189 classroom presentations were given in France, benefiting a total of 5,942 students. - Middle school (11 to 16): fossil fuels, with a focus on oil and gas fields, renewable energies and sustainable development. - High school (13 to 18): the energy mixThe range of energy sources of a region. and sustainable development. Any teacher who wishes to request a presentation in their classroom can complete the form available in the teachers’ corner on the Planète Énergies website, in the “Classroom Presentations” section. 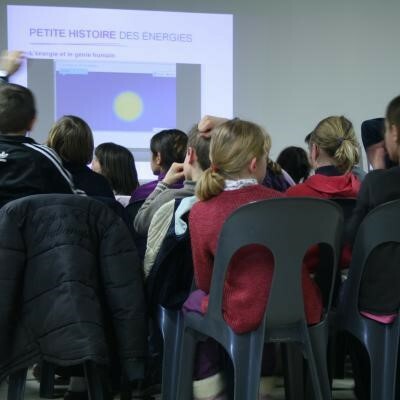 Planète Énergies and Nathan have joined forces to create tools for elementary, middle and high school teachers to explore the world of energy in their classrooms. 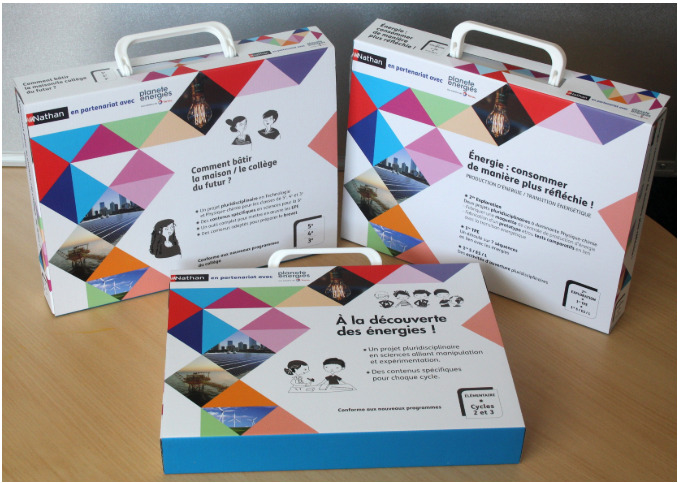 Fully compliant with the new school curricula in France, the kits are adapted to each educational stage and provide teachers with an opportunity to undertake energy-related projects with their students as part of a multi-disciplinary approach. Since the beginning of the 2016-2017 academic year, teachers can order or download the educational kit containing interdisciplinary Planète Énergies materials from the teachers’ corner, free of charge. More than 2,563 kits or learning materials have been ordered since September 2017. A total of 12,092 teachers were members of the teachers’ corner at January 22, 2018. The immersive educational stand offers a “Trip Through the World of Energy” presenting the life cycle of fossil fuels and renewables. Alongside the “Trip Through the World of Energy”, the “Energy Wheel” offers visitors the opportunity to test their energy knowledge. These learning materials can be used at local events. Science Festival (Fête de la science) at the Cité des Sciences in Paris. A total of 5,580 people visited the stand in 2018. 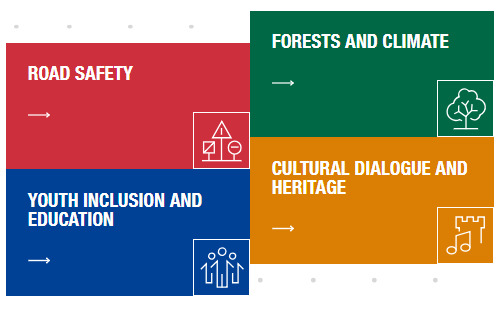 Total Foundation encompasses citizenship initiatives carried out every day around the world by Total’s sites, affiliates and corporate foundation. Through this global program, the Group aims to contribute to the growth of its host communities and regions, alongside its partners. Given today’s difficult economic environment, youth inclusion is a real challenge. Increasingly more young people are finding themselves in at-risk situations across continents worldwide. Total Foundation encourages young people from socially vulnerable backgrounds to become more autonomous, enabling them to take control of their future, participate in local economic life and find their place in society. Working in partnership with schools, nonprofits and companies located in our host regions, we develop training programs to foster entrepreneurship and initiatives to support personal development and academic success. - Foster academic success and soft skills, as self-confidence and an understanding of appropriate social and professional behavior are springboards to opportunities for young people. - Promote access to general and vocational training, especially in industrial disciplines. - Support entrepreneurship through assistance for business creation and social innovation. Left behind by the traditional schooling system, some young people give up hope and lose confidence. However, thanks to Production Schools and their “learning by doing” approach, they can regain a desire to learn. Classes cover a wide range of fields such as cooking, locksmithing, carpentry and software development, opening the door to a job and a new future. The private nonprofit institutions prepare young people for vocational qualifications using an innovative educational model based on real-life situations and genuine customers, both individuals and manufacturers. During the program, the students not only acquire practical know-how but also develop a sense of responsibility and confidence. The results are convincing, with 100% of students finding a job or undertaking further study after finishing the program. We have pledged to provide the French National Federation of Production Schools (FNEP) with €60 million in financial support over ten years, in order to increase the number of Production Schools to 100, or one per département. Eventually, close to 2,000 young people will graduate from Production Schools every year. Today, one in six students in France leaves school with no qualifications, resulting in a pool of wasted talent that fuels social vulnerability. In response, United Way-L’Alliance, a joint philanthropy project, aims to provide long-term support to 15,000 young people in some fifty priority middle schools, with a view to helping them enter the workforce by 2020. To do this, it brings together established local stakeholders such as nonprofits, companies and local governments to offer early school leavers tailor-made solutions, with employees volunteering as tutors and nonprofits providing the framework. To successfully integrate into the community and the world of work, young people need to develop both their technical know-how and their soft skills. Providing them with the keys to do this means creating the conditions for them to take control of their professional future. Total Foundation is a committed member of United Way-L’Alliance, in partnership with some 20 companies and the French Ministry of Education. Patrick Pouyanné, Chairman and Chief Executive Officer of Total, has been appointed Chairman of the project to encourage more French companies to get involved. Created in July 2001, Total Professeurs Associés (TPA) is a nonprofit organization whose goal is to build bridges between the oil industry and universities and other postgraduate institutions through technical and business lectures given by professors and experts. Member professors are working or retired Total employees who lecture in their field of expertise. Together, they cover all the technical and non-technical areas that a large international group can encompass. A regularly updated list of courses and professors is available on the website. In Europe, engineering and business schools and universities that are interested in one or more of the lectures offered approach TPA with their request. The association approves the request and puts the relevant member professor in touch with the interested school or university. They agree on course dates, content, prerequisites and audience level and, where applicable, any compensation. TPA can cover member professors’ travel expenses, but does not charge for its services. The association also handles teaching logistics (CDs, printouts, etc.). All TPA courses outside Europe are organized via the appropriate Total Group affiliate.